Hello everyone! Welcome to a Control Freaks Blog Tour! This month we are talking about LOVE! I am stop number 4 on the tour right after LeeAnn Greff! I know you were inspired by her projects! Since Valentine's Day is coming up, I decided to use our theme for that! 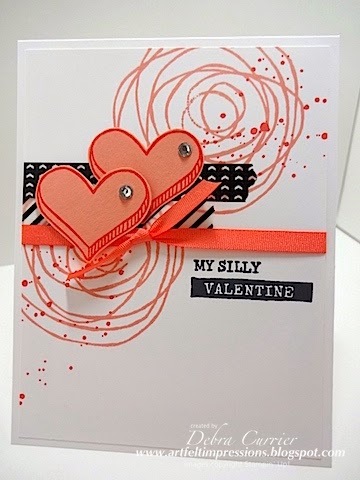 Both my projects use the Snuggles & Smooches stamp set! This set is just so much fun! I hope that you have felt the "love"!! I had fun making these projects and I hope you enjoyed them, too! You will find tons more inspiration as you move through the tour! It's time to send you on to the fabulous Melissa Davies! Thanks for stopping by and have a super day! Deb, I love both these cards you made with this set (that I didn't order, sniff, sniff!) The first is so "free" and artsy and the second is so prim and proper... both are lovely! 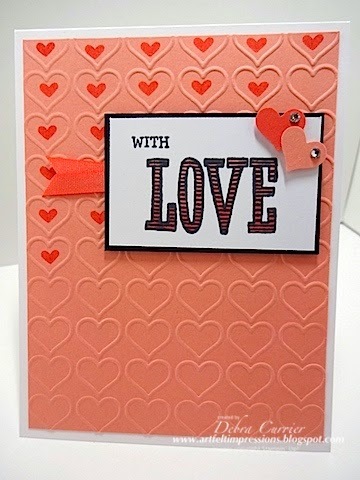 I love those tiny hearts in the embossing! Great idea! Beautiful cards....would not have thought that these two colors were a combination but the more I see, the more I am liking them!